Here is the weekly review of the top performing Bakersfield College men's basketball alumni, who are currently playing pro basketball in Europe. Deandre Dickson (6'9''-F, played for BC from 2014-16, now plays in Slovakia) could not help one of league's weakest teams Zilina (11-8) in their game last Wednesday. Despite his good performance Zilina was defeated 73-67 at home by the higher-ranked Iskra Svit (#3). Dickson recorded a double-double by scoring 14 points and getting the same number of rebounds in 31 minutes. It's Dickson's first season with the team. 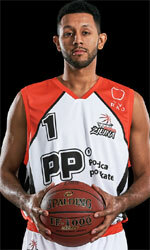 He has relatively good stats this year 14.4ppg, 7.2rpg, 1.3apg and 1.2bpg. Darrin Dorsey (6'2''-PG-87, graduated '11, plays in Romania) contributed to an Cluj Napoca's victory against the fifth-ranked Sibiu 84-80 in the Romanian Liga Nationala in Saturday night's game. He scored 6 points, had 7 rebounds and dished 6 assists. U-Banca Transilvania Cluj Napocais placed first in Group Red. This year Dorsey averages 9.7ppg, 3.7rpg and 3.0apg in three games he played so far.